When you have a mobile app idea, you don’t only want to get it into the hands of users as soon as possible, but into as many sets of qualified hands as possible. The most obvious way to do that is to make your app accessible to every smart phone user in the world, or at least the two main players in mobile. So, you take a look at your capital and realize this is a champagne taste on a beer budget situation. You try to trim and rework, but all signs are pointing to the fact that you need to enter the market on one platform instead of two, with the 2nd parked as a fast follower. You had everything planned out for both, and now you have to determine which is best for your unique idea, iOS or Android? It seems that most startups launch iOS first, but there are key differences between these platforms and the audiences you can reach through the corresponding devices. Let’s see which one best complements your business. In both the U.S. and global markets, Android OS leads in number of users. In the States it is a closer call with 53% Android and 45% iOS, making both strong contenders for reaching target users. However, in the global market, the gap between the two grows exponentially with 75% of the market dominated by Android. The reason these users are continually in the majority, both in the states and globally, is due to a plethora of devices running the Android software. iOS is limited to Apple iPhones alone and thus maintains a smaller share overall in this space. If having an increased user pool is important to your application’s success, vs. initial user spend, then pursuing iOS and Android, or kicking off with Android alone gives you the most opportunity to penetrate the mobile market. Apple has restrictions in place for all areas of their processes. We see this with app or build update submissions to the app store where an array of criteria is required and each push reviewed by a real person. These strict guidelines make submission and acceptance lengthy, particularly at first submission. For application owners and development teams this can cause delays in getting new builds or updates to the users. The positive to this is that the app store is typically considered very secure and free of copy-cat apps. Android still has a review process with criteria that needs to be met, but it is more lenient and thus the time to submission moves more quickly. As mentioned previously, Android users are in the majority, both in the states and globally due to a plethora of devices running the Android software. iOS is limited to Apple iPhones alone and thus a smaller share overall in this space. This accessibility also makes Android the strongest choice if you are targeting audiences in developing nations, as you will get the furthest reach to those user segments through the more available (and affordable) Android OS devices. If you are targeting users in Asia, Android is significantly more dominant in that region and will get you the best audience reach (Japan being the outlier). If your app idea focuses on users who are in North America, Australia, or parts of Europe, iOS gives you the largest pool. iOS users are shown to have higher household incomes, and when looking to develop a paid application or free application that will be initially reliant on in-app purchases, iOS is a stronger option. Compared to Android, iOS users are 50% more likely to make in-app purchases and spend nearly 2.5x more in-app. When it comes to updating software versions on user devices, Apple follows up frequently with notification to upgrade and maintains a high number of users on the most current software version. On average, 65% of iPhone users are on the latest version of iOS. This makes it easier from a development standpoint to push new features to customers without supporting old versions or issues. 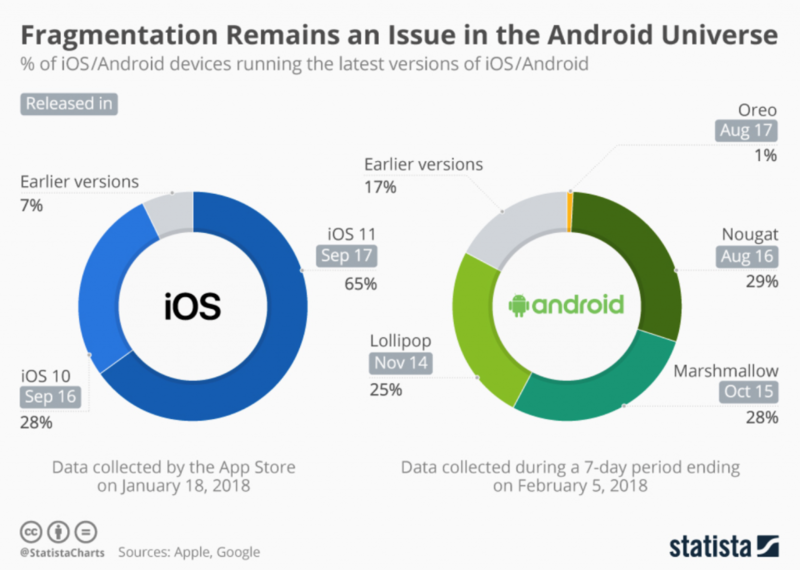 Android hasn’t quite reached their audience in this way and we see a split nearly into quarters between the latest few versions and those prior. This variation in operating software versions means far fewer users on the latest, making it hard to get updates into their hands and requiring additional support for many potential versions, even though outdated. You will need to plan for additional Quality Assurance time, ensuring even the smallest change is working correctly, on 2 to 3 times as many versions as you would iOS. The common statement “iOS now, Android later” may be widespread across the internet, but as a startup you should know that this is not a rule. Your unique business goals will dictate the best platform for you to enter the market, and while this is iOS for most U.S. startups, there are factors that often point towards Android. From the above snippets you may already have an idea as to which is best for you, but with our experience helping to launch hundreds of startups (many of whom hit the store on only one platform) we know that big strategic decisions are rarely made from content in a blog post. Save the Google searches and connect with our team of experts to get your market entry strategy today.